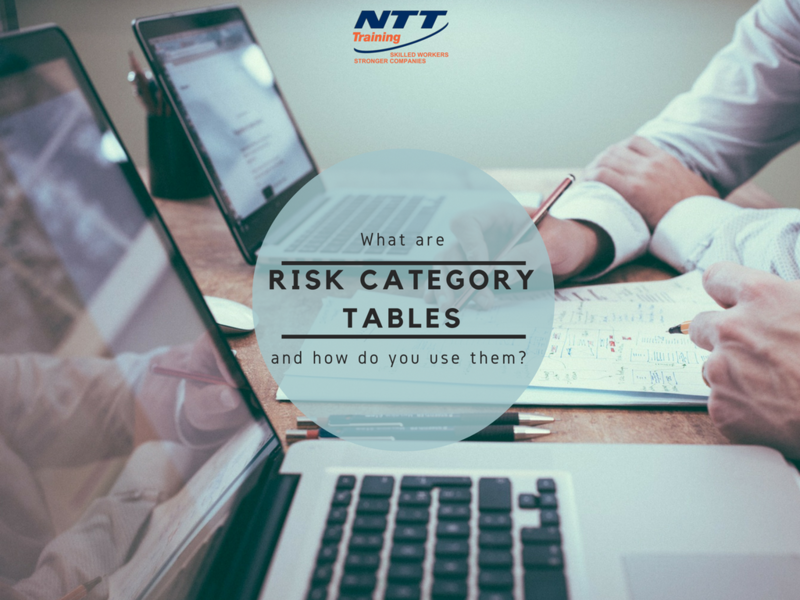 NTT Inc. - What are Risk Category Tables and How do you Use Them? What are Risk Category Tables and How do you Use Them? Risk tables are a part of arc flash safety that lets you know probable sums you may have to invest into insurance, necessary operational improvements, and additional legal liability limiting systems like additional training. With easy access to knowledge of both the level of risk inherent in an individual type of operation and the risk of a particular category, you can run a much leaner operation with less down time. What is a Risk Category Table? A risk category table is a quick reference sheet or PDF document that allows a shop floor employee, member of management or trainer to access specific knowledge that can both aid them in being more effective in their job and help them remain safer. Using these tables, specific situations can be referenced and particular safety guidelines can be clearly written. While the electronics you work with will be proprietary, having a risk category table can instruct employees and managers in what type of personal protective equipment (PPE) they may need in a given situation or what special precautions they should take. With risk category tables, large amounts of information can be easy to scan over instead of trying to “wing it” and risking employee health. In time, employees who reference the risk category tables on a frequent basis can become far more knowledgeable. Employees will tend to learn what they practice every day. However, in some cases their knowledge may be incomplete, either due to inexperience or due to changes in how your systems operate. With a group of effective tables at hand, employees can expand the knowledge they already have and keep themselves safer. Further, employees who are more knowledgeable on the average tend to be safer in aggregate, as they share this knowledge with one another. Better and more succinct reference materials mean safer employees. Providing a quick reference for employee health and safety is a valuable part of your responsibility as management. When employees can quickly reference what they may need to know in a given situation, their likelihood of guessing is reduced. The information they tend to act on is a lot clearer than “asking around” and letting a group consensus decide their actions. Being able to reference data quickly can also supply technical details that may be less obvious, particularly to less experienced employees who may have never been in a similar situation. Risk category tables let employees know what they need to do at the exact moment when they need to do it. OSHA expects you to provide information to your employees that will keep them reasonably safe if followed. While you may not always have direct control over the choices a given employee makes, you can substantially increase your likelihood of getting through an audit successfully. If you do not provide this information, you could be subject to fines and potentially even experience a shutdown, pending investigation. Such a dramatic situation can be avoided using reasonably simple tables and other training tools that keep you compliant with both federal and local workplace safety laws. You may face liability issues if your workers are conducting themselves in unsafe conditions. Further, you may even find yourself facing a class action suit or a rash of workers’ comp claims if you do not provide either effective PPE or the training tools needed to use your existing safety equipment effectively. Whether your company pays for insurance directly or merely uses reinsurance on its self-insuring plan, you need to protect it from liability. One of the best ways to do this is to ensure that risk category tables are available and followed, particularly when they are coupled with more immediate safety literature employees may need. Downtime expenses can quickly mount up when you do not provide adequate safety information. Injured employees rarely show up for work, and many injuries that happen every day can be prevented. Risk category tables can be an effective means of disseminating safety information that includes the type of PPE to use, when to use it, and what situations demand a certain level of personal protection. When you ensure that your employees at least know what to do, your main task becomes ensuring compliance instead of determining what compliance is in a given situation. Trusting your training to a premium company can ensure you meet every legal requirement, and can pay for itself many times over in up time and reduction of legal liability. NTT Training Inc is accredited by the highest standards of the Accrediting Council for Continuing Education and Training, or ACCET. Seek out NTT’s two day Arc Flash Electrical Safety Training and your investment will pay for itself many times over.